It has been a century since Einstein presented his theory of general relativity but it is still helping us unveil some of the deepest mysteries of the universe. Now the LISA pathfinder mission will prepare the way for us to study violent events that we've never seen before – such as the creation of massive black holes. 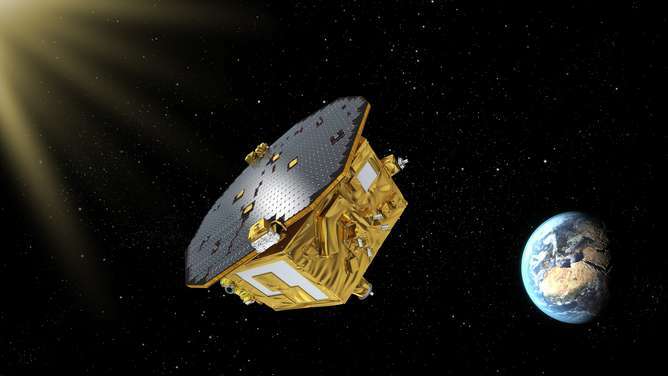 The probe is to test technology needed to launch another mission, eLISA, in 2034, which will aim to detect ripples in space known as gravitational waves. Intriguingly, the project may also help us prove some of the most extreme aspects of Einstein's theory of general relativity. General relativity states that gravity is just a manifestation of the fact that mass causes the surrounding space to curve, and it is the curvature of space that dictates the path followed by any other object, or indeed by light. When the Earth goes around the sun, it is the huge mass of the sun that distorts the space around it, leaving the much less massive Earth just following as "straight" a path as it can, but in a curved space: the net effect is the orbit that we are familiar with. Seeing directly to the heart of such events will never be possible using normal telescopes that measure electromagnetic radiation. This is because the excited matter typically surrounding such events would obscure our electromagnetic view. Also, black holes, which we have never observed directly, emit virtually no electromagnetic radiation. But Einstein predicted that they do emit gravitational waves if they are accelerating – as they would if in an orbiting system – which is why a gravitational wave detector could "see" them for the first time. eLISA will comprise three satellites in a triangular arrangement with arms of some millions of kilometres. Precision arm length measurements will be made between "test masses" in each spacecraft – freely-floating mirrors that reflect the measuring laser beams that will travel along the long arms. a wave should stretch space in one direction and shrink it in the direction that is at right angles. ...the EM view won't change due to the ripples. This has nothing to do with any "EM view" (whatever that is supposed to mean). Can't wait for the patch when this boondoggle also fails. But still there seems to be plenty of time left for science to first wake up from their 100 year dream. "The objects didn't move, the space did. Along with everything "embedded" in it. They are trying to view a phenomenon from inside a reference frame that is effected by it. But to get outside it you would have to get outside spacetime...."
We have found evidence of the expansion of spacetime, which, if your statement here is correct, should be impossible, because afterall, we are "trying to view a phenomenon from inside a reference frame that is effected by it." You're gonna have to revise that. Just making things up doesn't make you right. "Redshift is only evidence of a frequency shift." Which is best explained, and derived, by GR. Saying it's "just mathematical" is a joke. You can say that to anything. It is an utterly worthless argument. We measured the effect. It conforms to the math. We can predict it with accuracy. "Just mathematical" is quite the understatement. "That ANY photons arrive at our detection instruments blueshifted should have been a clue that spatial expansion doesn't cause redshift"
That's laughable, and demonstrably false. "That the furthest objects we view are the most redshifted indicates that distance, combined with travel through space causes the frequency shift." Oh lord. So now you're asserting some kind of tired light mechanism? Tired light was rejected for very good reasons. If it was just due to traveling through such a large amount of space, there'd be measurable effects to prove that, such as a blurring effect on the farthest galaxies. Since we don't observe these effects, what explanations are we left with? Well, one is space is expanding, which just so happens to also be derivable from our very best theory of how the large scale universe works, and also just so happens to explain the CMB. That's pretty convenient. The arms are embedded in the space as is the light from the laser, a gravitational wave doesn't change the relative positions of objects in space because the objects do not move inside the space. There is a blurring mechanism between ourselves & any point beyond planet Earth. Within every cubic kilometer of interstellar space are at least half a dozen micron sized particles of matter, sometimes more but seldom less. Anytime a photon encounters the electrons of a dust particle a photon scatter effect occurs due to the imparted energy the photon may impart to an electron causing the electron to recoil, this impartation of energy from a photon to an electron causes the wavelength of the photon to degrade to a lower frequency, in other words the photon is redshifted. Do this to a photon enough times over a span of time amounting to billions of light years, is it any wonder the most distant galaxies appear redhifted? It isn't just "expansion" causing redshift because the laws of probability absolutely preclude any probability that photons can't be redshifted by the random presence of matter, just the opposite. If light travels in a straight line and it is space that is bent, how can the measured distance between the objects change? because in physics we don't measure length by a ruler but by the time it takes for light to traverse it. A ruler would be affected by the distortion and show no difference (as the ruler would be stretfched along with the space). Light, on the other hand, will spend a longer time in a distended spacetime until reaching the end. Light will still travel the straight path. Spacetime changes while the wave travels through the setup That's the whole point of what they are trying to measure. "Matt, good regurgitation of everything you have been taught, but this conversation actually requires you to think about the concepts you support and understand them, not just accept that everything works as you have been told and site the people who told you as authorities. It is them that I would be disputing, not you." Anti is literally laying it out for you, and you keep going back to your misconceptions about how it works. I would challenge you to actually think about what you're saying. Astrophysicists aren't as dumb as you think. Your dispute is the equivalent of a scientific strawman. @ matt_s: You need to read about Compton Scattering, the "photon scatter effect". This is not "tired light" as I pointed out above. If you had a more in depth comprehension of nuclear physics, as I learned in studying Nuclear/Electrical Engineering, you would understand Compton Scattering. To this point in the discussion you don't even acknowledge any knowledge of the "effect". Give it a try. "It isn't just "expansion" causing redshift because the laws of probability absolutely preclude any probability that photons can't be redshifted by the random presence of matter, just the opposite." Lol. Oh, and touting your degree like it gives you authority just makes it seem like you have no credible arguments. Oh, well just laugh out loud, I've actually taken several courses in nuclear physics & I know exactly what Compton Scattering is & it is not "tired light". You only think it's "tired light" simply because you want to be some kind of a "hip guy" nuclear physicist imagining you know things about nuclear physics which you obviously do not. By the way, the "tried light guy" is also the godfather of Dark Matter, & don't tell me you don't believe in that. It was a proposed mechanism for tired light, which was falsified. Oh just stop it with the charades, go find out what Compton Scattering is, if the nuclear physics of it is too deep for you, we'll just chalk it up to "beyond matt's comprehension". But you believe in DM don't you? Of course you do, the reason being is that there is no testable nuclear physics behind the hypothesis making it impossible for you to be proven either wrong or right. You just love to banter over this limbo stuff because it makes you feel so relevant about subject material you actually know nothing about, Nuclear Physics. Reading up on it won't change the fact it's been falsified as the source of the redshift. Can we take it you understood the subtle aspects alluded to in my observation? I can't really explain it any more simply than I already did in the previous posts. The experiment is not that hard to understand. @ Really-Skippy. How you are Cher? Oh yeah, I am as good as any Ira-The-Earthling could be, thanks for asking. Does all that stuff you just wrote the anti-Skippy really mean something or was it just goofing around? If it really means something I was hoping you would explain to your fellow Earthling, me ol Ira-Skippy, exactly what it is about. In simple words I mean. Choot, you can use the electron ducks and water ripples if that makes it easier to explain. So where is the paper you've written? Or are we all supposed to read about it on some crackpot science website? i.e. put up or shut up. @ Bennie-Skippy. How you are Cher? Oh yeah, I'm fine and dandy me, thanks for asking. If you are talking about Zwicky-Skippy, you are right about that. But you leave out the good part. That was just after the Hubble-Skippy did his expanding stuffs. Zwicky-Skippy only had the tired light idea off the top of his head when somebody asked him to comment about Hubble-Skippy's idea about tired light. But after thinking about, he throwed tired light away because it would not explain the things they were seeing, just like Hubble-Skippy did too. Dark matters came about because he did not like the tired light idea so he thought that would explain what they were seeing better than tired light would. Non Cher. I am not the scientist like you are not either. I just read a book about the astrophysicists in the 1890's through the 1940's. Think of the tunnel, everything bends so nothing effected could perceive it. Wrong. To start with, LISA is comparing two of those tunnels. Light from supernovae affected by gravitational lensing is observed to arrive before or later depending on which path (which "tunnel") they took, that is why we can observe several pictures of a same event arriving at different moments. Now picture you this: LISA defines a triangle. If a G.Wave changes the length of only one side, it also changes the two angles at the two extremes. You will either perceive a laser misalignment or if you force the alignment you will perceive different side lengths, but in either case the effect is measurable. As well as anything relativity would have you believe is embedded in spacetime, including the beams. If space works the way it is described in this article and the waves propagate through spacetime, the EM view won't change due to the ripples. For once at least you're dead on. It's a fudge to say that the stretching of the interferometer causes interference pattern to change, as you state it's actually insensitive to that because light stretches with the arms of the interferometer. The way the interferometer is actually sensitive to gravitational waves is not the spatial effects by the effect the waves have on the photon's "clock". It is a fudge but a convenient one as the resulting behavior of the interferometer is just as if it is stretching. There's a very good technical explanation of this, "If light waves are stretched by gravitational waves, how can we use light as a ruler to detect gravitational waves?" written by Peter Saulson from the LIGO collaboration. No it doesn't explain why I'm wrong, it only explains their own opinion of the issue. Tagging something as "tired light" in diminutive terms does not deny the nuclear physics of Compton scattering, it's real, it's how energy is distributed throughout the universe. If you'd have ever had courses in Thermodynamics you'd know what I mean. An expanding universe cannot explain how energy is distributed throughout the universe, therefore the mechanics of redshifting is only partially explained through a doppler type effect by which means energy cannot be distributed throughout the universe. So you're quite correct bschott to point this out but rest assured you're not to first to think of this. Hundreds of millions have not been wasted on LIGO and LISA. No duh it's real, but it's not the source of the redshift. So the proposed gravitational waves only contract space time? Do they not have the usual expansion and contraction of compression waves or the cyclic phases? Such that the interferometer arm length only ever contracts momentarily? Never expands? Does not average the original arm path length? How much does the measurement depend on the gravitational wavelength in relation to the interferometer arm length? Do they not have the usual expansion and contraction of compression waves or the cyclic phases? The field is quadrupole, so the field lines are similar to the EM field of a particle accelerator like the LHC, which should make sense as particles are accelerated in both cases. Such that the interferometer arm length only ever contracts momentarily? Never expands? No, when it contracts in one direction it expands in the orthogonal direction. Does not average the original arm path length? Should be a sinusoidal oscillation about the unperturbed arm length, I think. Quite a bit, different arm lengths will have resonance with different frequencies, see the Wiki page. So you're saying you have it backwards then. Please see Ira for a pointy hat. Gravity doesn't have sources or sinks but just sources (mass). So the surface integral will only ever be non-zero when there's a mass within the region covered by the surface. For an "only contraction" wave some mass must therefore travel along with it. But since no massive particle can travel at the speed of light such a gravity wave _must_ have surface integral of zero. Which in turn means: it it's contracting spacetime in one direction it must expand it in the other. If LIGO worked...why are they building LISA? Because LIGO worked so well for advancing physics from quantum optics to seismic isolation to distributed computing data filtering/processing (to name a few areas), and worked as advertised by placing strong constraints on the GW stochastic background, among other accomplishments. And because LISA will be sensitive to different frequencies as well as having the advantages of operating in a far less noisy environment, and in the vacuum of space. As was said LISA will be sensitive to much lower frequency gravitational waves than could ever be detected on Earth. LIGO is sensitive to supernovae and GRBs, LISA would be sensitive to colliding supermassive black holes. That's interesting because it tells you not just about how black holes merge but the cosmic history of such events, ultimately how supermassive black holes formed (did they grow by accretion or mergers). LISA would also open up new cosmology with continuous wave sources which would be extremely powerful in constraining cosmology. It's totally different science, LISA isn't being built to just detect gravitational waves, that is still LIGO's job. LISA is a gravitational wave observatory, it will use them as an observational tool. Advanced LIGO has only just commenced it's first run. Rumours are flying but until there is a paper we don't know. If aLIGO doesn't make a detection LISA is in trouble. The big bangers evolutionists do not see black holes. They do not see God also. But believe in black holes. Not in God, because God has high moral standards and create order int the universe. Black holes do not have moral standard and create chaos in the universe according to philosophers which claims that these invented objects exist. I believe that the Bangers are actually creationists, also. It seems that everything must eventually be assumed to have been created in an instant, and only evolve a bit more thereafter?? Afterall, now they have found early galaxies much bigger than our own. So as the early evidence against them continues to mount, the Bangers will just keep patching their faulty model, until even they must accept that they too are actually creationists. Patch upon patch says so. I hope they find their god. viko, "Monseigneur Georges Lemaître, a Belgian Catholic Priest, was the originator of what would become known as the "Big Bang Theory" "
Some, like tuxford, even try to use that to claim the Big Bang is a creationist theory. Claiming only atheist scientists support Big Bang theory and evolution isn't going to magically become true if you just keep repeating it enough times. You just make yourself look even less credible and in touch with reality. And because LISA will be sensitive to different frequencies as well as having the advantages of operating in a far less noisy environment, and in the vacuum of space. So you don't understand GR at all, nice talking to you. With a remark like that, I understand you're incredibly unaware of the many challenges to operating a terrestrial laser interferometric gravitational wave observatory. If so then how can we really tell where anything is? Because gravitational lensing is in general very small. Even in the most extreme massive clusters in the universe the deflection is tens of arcseconds, that is strong lensing which is rare. Weak lensing is the domain most objects find themselves in, where galaxies aren't imaged multiply or drawn out into arcs but are squashed slightly, and enhanced in brightness. People study weak lensing for cosmology, for so called cosmic shear and galaxy-galaxy lensing. It's a very powerful tool, a number of great surveys and missions are underway to study it. For the vast majority of galaxies however the deflection is smaller than the size of the galaxy on the sky. @Everybody who are here to defend GR and the usefulness the Michelson-Morley interferometer to measure gravitational wave. I lack the time to argue with bschott and I am also curious to see if some of you can come with the proper answer. uh, the mirrors for LIGO are referred to as test masses and they're suspended from a 4-stage pendulum apparatus called a "quad". Did you have a proper question? Yeah but .. For any given cosmic event, expansive or explosive, is there more than one wave? And does the wavelength depend on the rate of the 'explosive expansion'? Thanks Proto, interesting link. I had a quick look but it's very late here and I'll revisit the info again tomorrow with more concentration. Thanks again. Hum, funny reaction! In case you have any doubt, I know that you are an insightful and credible person. But in case you don't know, I am also here in the defense of accepted of accepted science. I understand that you know very well what gravitational waves are. But your argumentation with bschott makes it feel like you do not fully grasp the theory and the technology behind LIGO (might this be possible?). What's more the reaction you had to my comment left me perplexed. Do you understand that the mirror suspension setups make them technically the equivalent to free falling masses in the axis of the laser beams and that the GW are going to rock them back and forth something in the order of petameter maximum? @Techno, the article points out that the mirrors for LISA are "freely-floating". That's not the case with the mirrors in LIGO, contrary to what you stated. In both cases, the mirrors must be kept stationary (at rest) with respect to each other in order to make proper measurements. If you have a question or want to make a point about the science, have at it. My personal understanding is far from complete, almost as far as your inquiry about it is from relevance, so thanks for sticking to the science. contrary to what you stated. In both cases, the mirrors must be kept stationary (at rest) with respect to each other in order to make proper measurements. When somebody is not well versed on a subject, he should check out first before writing back. This would avoid this situation. "Because of the in-vacuum threefold pendulum suspension, the bottom mirror is quasi-free-falling in the direction of laser beam propagation and highly decoupled from the environment." Well what do you know. that is about the same thing that I wrote earlier... exept that I already knew that. Hey, I just wanted to help. Well what do you know. that is [!]about[/!] the same thing that I wrote earlier. Yes, but this "situation" arose from comparing LIGO (with quasi-free-falling mirrors) to LISA, where the mirrors [!]are[/!] in free fall. Well lets see were you took this "perfectly still" from and put it back context. "LIGO's passive damping system holds the all-important mirrors perfectly still through a 4-stage pendulum called a "quad". In the quad, LIGO's test masses (its mirrors) are suspended at the end of four pendulums by 0.4 mm thick fused-silica (glass) fibers. The "Main Chain" side faces the laser beam, while the "Reaction mass" side helps to keep the test mass steady from noise not associated with astrophysical sources." IOW it isolate the pendulum from any random vibration induced here on earth BUT NOT motion that would be induced by astrophysical sources. Right, hence "quasi-free-fall". A passing gravitational wave doesn't induce motion in the mirror(s), Techno, it changes the length(s) of the whole arm(s). Lots of comments here. So I might as well put my two bits in too. In the 70's when everybody was trying to use tuned cylinders to test for gravity waves I had a good laugh because it's not possible to "feel" them unless you are close to the source. I said at that time that lasers are the only way to test for gravity waves from our location. But it would still be difficult because all measurements are within the affected frame, not from the unaffected reference frame. LIGO and any similar setup is correct in style, but detection is restricted by certain factors. (1) it is very directional (2) it is highly wavelength dependent (3) it can only detect interference due to gravitational redshift (all other variables will cancel). So detection will be severely limited at best! (Unless there is some star trek quantum effect we haven't discovered yet). Not really, because the arms are at right angles and the earth turns. LIGO isn't supposed to look at a particular source - just any source will do. It's at the detection threshold of what is predicted for binary inspirals and supernovae (which is an instrument as can currently be made.) While not constant these two are fairly frequent events in the observable universe, so the chances are pretty good. LIGO detects a phaseshift - not a frequency shift. I'm not the one hoping to find out what I already know. But thanks for taking the time to post the link, it's a good video. The largest relative motion between test masses would come from a wave propagating in a direction orthogonal to the beam axis, so if it should perturb the test mass at all gravitationally it would be sideways from the spacetime interval being measured along the arm. It's a higher order effect we detect as "relative motion" between test masses. But if you were to place a meter stick next to each mass and try to measure a displacement (indicating motion) individually, you'd measure zero displacement (hence zero motion) because the meter stick stretches and compresses as the waves pass by. For any given wave, it will cause the greatest relative motion between the test masses when it's propagating in a direction orthogonal to the beam axis. But gravity from the source is then pulling on the test mass from the side, at a right angle from the beam axis, because that's the direction the source is in. If you were facing the side of the test mass, with the beam splitter to your left, and with the source behind you, the spacetime between the beam splitter and mirror stretches just as much as the spacetime to the right of the mirror well past the end of the arm, as the wave passes by. The mirror isn't moving to the left and the right, it's going from shorter/fatter to taller/thinner. I'm skeptical, when the BART probe failed to find my shorts, I basically gave up on science. I'm kidding, this is awesome. Every sensor we launch into space will one day be duct taped to a starship, so it's like watching one evolve. Gravitational waves are fugacious events that happen to superpose with the earths gravitational well. Normally if you stand at a fix position your body will naturally position its center of mass with the earth's gravitational well focal point. If, at that moment a GW event would happen, the focal point of this well would slightly shift position and continuously move as if it would be fluid. This would happen in such a fleetingly subtle manner that you would not have to compensate in any manner for it. During this same event, the same phenomenon would also happen under LIGO's pendulums and they would instantly accelerate toward the shifting focal point. When a pendulum is being accelerated, no matter how weak this acceleration happens to be and if the friction of its mechanism is sufficiently low, this pendulum is now in motion and will stay in motion for a while. A pendulum in motion oscillates. The acceleration to which you refer is in a direction orthogonal to the effect LIGO is trying to measure. The multi-stage pendulum is a brilliant design, and can even compensate for the radiation pressure from the laser beam bouncing off the mirror, but the mirror isn't free to swing sideways. The LIGO isn't measuring a leading order acceleration of the test mass, it's attempting to make a direct detection of higher order gravitational wave radiation. This "situation" isn't bad, Techno, it's been a learning experience for me. I had to look up the word 'fugaciuos'. Well Techno, if you don't want to apologize for insinuating I took "perfectly still" out of context, or that I'm not 'well versed' enough to make the point, and you don't want to say thanks for making it, or that you learned something from it about the science, well, you have a nice day anyway. Recall the strain diagram (with all the black boxes and squares) that Saulson held up in the video. If you're standing by the beam splitter, it's represented on the diagram by the center black square, and the test mass (mirror) is near the edge of the paper with an empty square next to it showing the "relative" displacement. But if you were standing by the mirror, then it would be the center black box showing no displacement, while the beam splitter would seem to be what's moving. So what's moving, the mirror, the beam splitter, or both? The answer is neither – they're both changing from shorter/fatter to taller/thinner (and back), along with all 4 km of vacuum in between. That's what LIGO is trying to measure. If the mirrors move (other than what's necessary along the beam axis to provide a reference of free fall) then the instrument isn't measuring gravitational wave radiation. Think about it – it's a gravitational wave observatory, not an accelerometer. Have you seen anywhere in literature mention of accounting for leading order perturbations (accelerations) caused by the moon, Jupiter, or other nearby masses? The only mention I've seen is that they're not compact enough to be a significant source of gravitational waves. I am sorry if it felt that I was letting you down. The delayed answer is because I am only 54, so I still work full time and I also train hard at foot race. I like you Proto, you are generally doing a fine job on Physorg. I am not here to argue against you but, although the basic idea of GW is easy to understand if you have some notions of GR, the fundamental physics behind GW and GW observation is hard science. As such, I will not pretend that I understand everything there is to know about it, but I understand enough of it to offer some guidance and I just want to steer you in the right direction. Quiz time Techno: were they simulating higher order "relative motion" or the leading order acceleration from a binary system that would be hard to distinguish from a point-source? A predecessor to LIGO was a resonant bar. 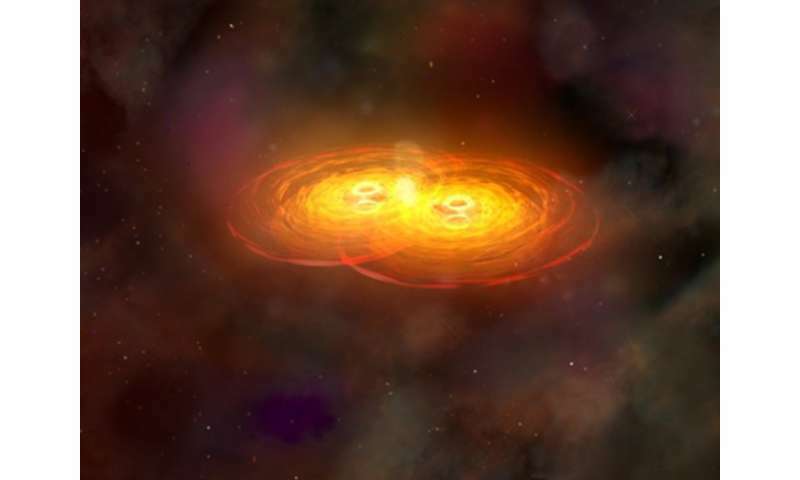 It was also used to attempt direct detection of the predicted tiny fluctuations in spacetime known as gravitational waves – no leading order acceleration in the universe would stretch and squish a massive solid bar. Think about it. We can already infer the masses of astrophysical objects, hence we can calculate the acceleration. Even if we could measure it, what does that have to do with directly testing general relativity's prediction's about spacetime curvature? Matter tells spacetime how to curve (what LIGO's trying to measure). Spacetime's curve tells matter how to move (or accelerate - not what LIGO's trying to measure).